Games with camping gear go past rock, paper, scissors or a last minute game of Risk to see who has to carry the heaviest load up the mountain to the campsite. Better yet, you can do more than host a s'mores eating contest around your very own fire (though that could be fun, anyway!). There are things you can do for fun that involve camping gear and toys designed especially for camping. In some cases, the camping gear you pack for games will be extra. Games with camping gear of the traditional sort are hard to come by, since you usually just bring along the basics for survival. One game that's taking camping by storm is called Petanque (pay-tahnk). It was invented in France, but has branched out to places all over the world as a way for everyone to entertain themselves-not just the young or the athletic. The object of the game is to throw metal balls toward a wooden ball to see who can get the closest. You can play on dirt, gravel, grass, and sometimes even sand, though that's not ideal. The game is always played in teams of one to three people. Your camp group doesn't have to be huge to play, and you won't be carrying a lot of extra weight in your pack if you want to take the equipment with you to your campsite. For rules and strategy, visit this site. Once you get a feel for it, you may want to visit Petanque.org for a more thorough education. Ladder Golf is another one that's getting more and more popular among the camping groups. You can play it on just about any surface, and it's lightweight, too, so it won't be much of a burden to carry for the sake of a little fun. The set consists of what actually looks like a short, wide ladder made of wood and brass, as well as sets of golf balls connected by strings (bolas). You earn points at the end of the game. You only get points for the balls left hanging on the ladder at the end; players are encouraged to knock the opponents' bolas from the ladder. Different rungs on the ladder offer different point values. The game goes on until someone earns exactly twenty-one points. Don't forget to take your favorite board games. They're lightweight, and as long as you don't choose the ones with lots of small pieces that are easy to lose, you should be entertained for hours. If you play a game like Guesstures, you can even incorporate camp equipment in as props. 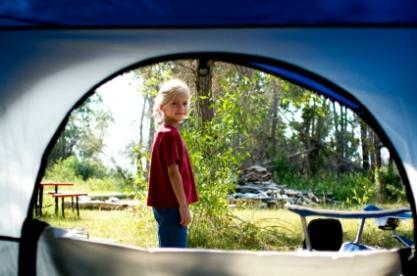 Camping websites often add a toys and games section to their selection. Why not buy a Frisbee or a kite for some old-fashioned fun? Parents, get back to your childhood with these simple but wildly entertaining toys. If you're tossing around a Frisbee, try to make up your own new moves and tricks, like catching the disk mid-cartwheel. Let the fresh air help you clear your mind and get creative! If you're a creative, verbal group, you may want to try sitting around the fire weaving stories together. One person starts, gets the plot going, and then it's on to the next person for their twist on the events at hand. You never know what you're going to come up with, with all those minds working at once! Remember the old-fashioned games you played as a kid? They've been passed on from generation to generation, and now it's your turn to show them to your kids, if you're interested and they're tagging along on your camping trip. Visit Games Kids Play for some help remembering the games you played and all the rules, too. Chances are, you'll run into some old favorites and some fun new games you've never played.